Background: Novel bioactive plant secondary metabolites, including flavonoids, offer a spectrum of chemo-protective responses against a range of human tumor models. However, the clinical translation of these promising anti-cancer agents has been hindered largely by their poor solubility, rapid metabolism, or a combination of both, ultimately resulting in poor bioavailability upon oral administration. Objective: To circumvent the challenges associated with herbal drug development and for effective integration into clinical setting, nano-engineering is one of the emerging pragmatic strategies which has promise to deliver therapeutic concentrations of bio-actives upon oral administration. Method: We assessed the nano-encapsulated flavonoid-rich fraction isolated from a traditional Indian herb Selaginella bryopteris (Sanjeevani) (NP.SB). 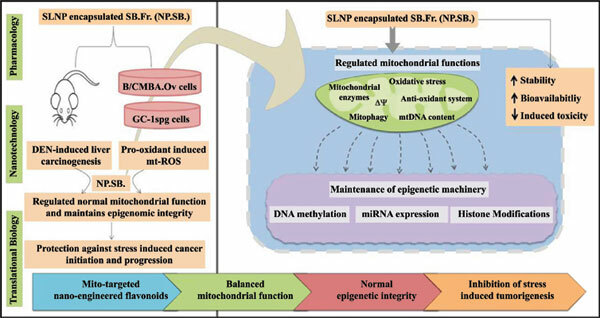 Both in vitro and in vivo studies were performed to evidence the epigenetic protection mechanisms of NP.SB through a mitochondrial-targeted pre-clinical validation strategy. Results: The mito-protective activity of NP.SB revealed a dose-dependent effect when tested in GC-1 spg (mouse spermatogonial epithelial) and B/CMBA.Ov (mouse ovarian epithelial) following exposure to Nsuccinimidyl N-methylcarbamate, a potential human carcinogen. Smaller size, rapid internalization, faster mobility and site specific delivery conferred significant cancer protection in cultured cells. Notably, this encapsulated flavonoid supplementation; prevented emergence of neoplastic daughter clones from senescent mother phenotypes in pro-oxidant treated GC-1 spg and B/CMBA.Ov cells by selective abrogation of mitochondrial oxidative stress-induced aberrant epigenetic modifications. In vivo studies using a diethylnitrosamine and 2- acetylaminofluorene mouse model demonstrated that NP.SB has a significant inhibitory effect on tumor growth which clearly substantiated our in vitro findings. Conclusion: Anti-carcinogenic property in conjunction with low toxicity of NP.SB, underscores the translational significance of dietary flavonoids as cancer-protective agents for preferential application in clinical settings. Cancer prevention, anti-cancer agents, epigenetic modifier, isocyanate, translational oncology, dietary flavonoids.